A career as a lawyer is an extraordinary calling. However, becoming a lawyer is an enormous undertaking in terms of time commitment and financial investment. Therefore, it is important to learn as much about the profession as possible before you embark on a career path as a lawyer. 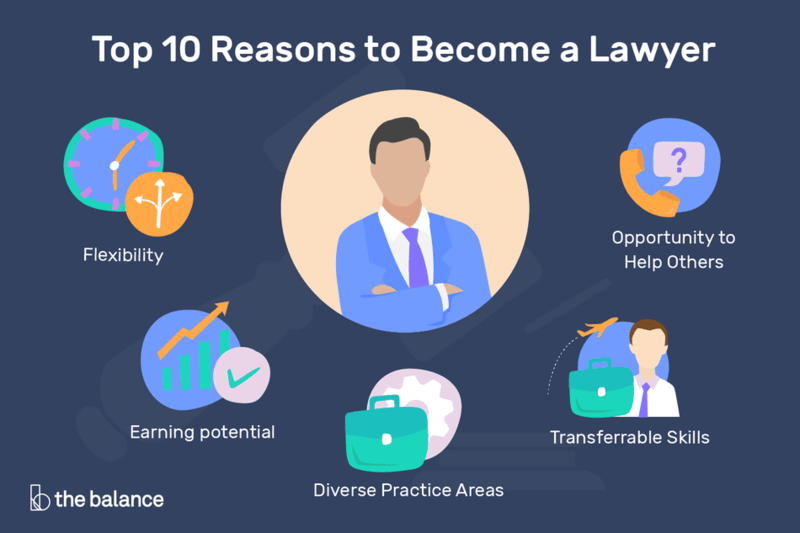 These top 10 reasons to become a lawyer explain some of the benefits of working as an attorney. Keep in mind that a career as an attorney has also had its drawbacks. Lawyers are among the highest paid professionals in the legal industry and most attorneys earn salaries well above the national average. While the median annual salary for all lawyers was $119,250 in 2017, the world’s top lawyers pull in million-dollar incomes. Keep in mind, however, that not all lawyers make big bucks and salaries depend on employer size, experience level, and geographic region. Lawyers employed in large law firms, major metropolitan areas and in-demand specialties generally earn the highest incomes. For generations, a career as a lawyer has been a hallmark of prestige. Impressive degrees, generous salaries, and an authority over others have placed lawyers in an elite circle of professionals who command respect and embody the definition of success. Today, lawyers still enjoy a unique professional status and a glamorous image perpetuated by the media. Lawyers are in a unique position to help individuals, groups, and organizations with their legal problems and further the public good. Public interest lawyers champion legal causes for the greater good of society and help those in need of legal assistance who might not otherwise be able to afford a lawyer. Lawyers in private practice often perform pro bono work to help low-income individuals and underserved portions of the population such as the elderly, victims of domestic abuse and children. Working as a lawyer is one of the most intellectually rewarding jobs on the planet. From helping to patent a trade secret to devising a trial strategy to forming a multi-million dollar merger, lawyers are problem-solvers, analysts and innovative thinkers whose intellect is crucial to career success. As the legal profession evolves, increased industry segmentation and specialization have led to a broad array of sub-specialties. Lawyers can specialize in one or several niche areas ranging from bread-and-butter practices such as employment law and civil litigation to niche specialties such as green law or foreclosure law. The majority of lawyers work in law firms, government, and corporations. In an age where cubicles have become the mainstay of the modern workplace, lawyers typically work in an office with four walls. Lawyers in larger firms enjoy plush offices, ample support staff and a variety of office perks ranging from gym memberships to box seats at sporting events. Even if you don’t practice law, a J.D. can open doors to new opportunities and serve as a stepping stone to a new career. The skills you develop in law school and as a lawyer can serve you well in many careers such as legal consulting, management, writing, mediation, and academia. As lawmakers, thought leaders and change agents, lawyers are in a unique position to affect societal change. For centuries, lawyers have stood at the center of society; they write the laws, rule the courts and hold influential positions in government. In these roles, lawyers are able to impact top policymakers and leaders and affect change around the globe. Lawyers are autonomous and have the ability to make their own hours, set their own fees and choose their own clients and practice areas. The job has an inherent flexibility that allows lawyers to attend to personal matters or spend a day away from the office if needed. A career as a lawyer also offers a number of other perks. For example, some lawyers travel the country, or the world, to participate in trials, depositions, arbitrations, and business deals. Other lawyers rub shoulders with business leaders, politicians, sports figures and even celebrities. Another perk of practicing law is learning to think like a lawyer: studying law sharpens your analytical, reasoning and critical thinking skills, giving you a new perspective on the world. If you are considering becoming a lawyer, these 10 factors to consider before attending law school and these reasons to choose a career in the legal profession can assist you in your decision.